If you’re looking for a good, general, all around anthology of short story detective fiction then I’d recommend the Longman Anthology of Detective Fiction edited by Deane Mansfield-Kelley and Lois A. Marchino. It will give novice and experienced mystery readers a good foothold into detective fiction. The book is divided into three sections: The Amateur Detective, The Private Investigator and The Police. Each section begins with a critical essay and commentary (which I skipped). 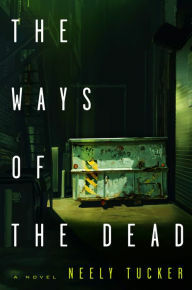 There are also two appendices: Notable Annual Awards for Mystery and Detective Fiction and a Bibliography of Critical Essays and Commentaries. But the heart of the book is stories. Each section contains stories by some of best authors, classical authors such as Sir Arthur Conan Doyle, Agatha Christie and Edgar Allan Poe, pulp authors of the 1930s-1950s such as Raymond Chandler, Dashiell Hammett and Ed McBain and current authors such as Sue Grafton, Sara Paretsky and Peter Robinson. There is a short author bio before each story, suggested books by the author and suggested read-alike authors. Granted, there are some great mystery authors not included in the anthology, but if all the greats were included it would be a thousand pages, just like Otto Penzler’s Black Lizard books. The Longman Anthology of Detective Fiction is an entertaining way for mystery fans to spend some time. It also makes readers appreciate the art of the short story. Go for it. It’s tough when your competition are masters of the trade. Ed McBain and Michael Connelly are the masters of police procedurals. Kathy Reichs is the master of forensic anthropology. The crown goes to Arnaldur Indridason for Icelandic mysteries and Thomas H. Cook for literary mysteries. And the head honcho for journalistic mysteries is Bruce DeSilva. So, while Neely Tucker’s journalistic mysteries, which take place in Washington, D. C., are readable, they don’t live up to the bar set by Mr. DeSilva. 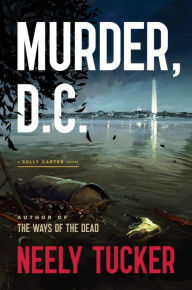 In Murder, D. C. Billy Ellison, the son of a prominent Black family in Washington, is found washed up on the shore of the The Bend, the former site of slave trading and currently a run-down park used primarily for drug deals. Sully Carter, reporter for ‘the newspaper’, is the journalist on the scene. Initial interviews with Billy’s mother and her employer, the prominent lawyer, Sheldon Stevens, portray Billy as a boy who had everything. However, as Sully gathers more facts, they soon change their tune, stating Billy was gay and was dealing drugs in a big way. Private investigators hired by Stevens seem to be making as little progress as the police in solving Billy’s murder. Those readers who met Sully in The Ways of the Dead, know he’s a likable character. He drinks a bit…well maybe a lot. He was reporting the war in Bosnia when he got wounded and has the scars and limp to prove it. He has a good working relationship with the police as well as one of the major drug dealers in the metropolitan area. And once he gets hold of something, he rarely, if ever, lets go. So, when things don’t make sense, Sully keeps plugging away, regardless of how many times he gets beaten up, suspended from work, etc. However, Sully Carter doesn’t have the edge and cynicism of Bruce DeSilva’s Liam Mulligan. In addition, the turmoil that the news industry is going through is totally ignored. This is surprising in that Tucker is a journalist, a staff writer at the Washington Post. The plot of Murder, D.C. is good. The characters are good. You’ll enjoy reading Murder, D.C. I just think you’ll enjoy the Bruce DeSilva/Liam Mulligan mysteries more. The Mammoth Book of Movie Detectives and Screen Crimes is indeed big, but not mammoth when compared to Otto Penzler’s Big Lizard books on pulp mysteries. Also it’s a fast reading book. Let’s first talk about what this book isn’t, though, because there’s a little misrepresentation here. The back cover states “Here are original stories of crime and detection that were the inspiration behind some of the best-loved screen successes.” By this I thought these stories were actually the bases for TV and movie mysteries. In reality, these stories were written by authors who created TV and movie detectives, but the stories themselves were not necessarily the basis for the movie or series. Having gotten that out of the way, The Mammoth Book of Movie Detectives and Screen Crimes is an worthwhile book, now that your expectations are set. Peter Haining, who has written much about pulp fiction of all genres knows what he’s doing. 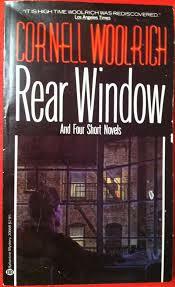 The best story in the book was It Had to be Murder by Cornell Woolrich which was the basis for Alfred Hitchcock’s Read Window. However, this story has no romantic plot to it; no Grace Kelly blond tending to the wheelchair bound James Stewart. 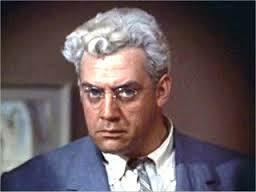 The film basically followed the story and I kept picturing Raymond Burr as the would-be murderer. The second best story which immediately follows Rear Window is Forbidden Fruit by Edgar Lustgarten and is a James M. Cain-esque story of a man and woman plotting her husband’s murder—think The Postman Always Rings Twice. It has the same darkness to it and a similar ending. Lustgarten introduced the British series, Scotland Yard, but this story was not a part of the series. Authors included in the anthology count as a partial who’s who of mystery writers: Edgar Wallce, Eric Ambler, George Harmon Coxe, Evan Hunter (aka Ed McBain), Erle Stanley Gardner, Georges Simenon and Ruth Rendell. Hunter’s story was the basis for the movie the Blackboard Jungle which certainly is not a detective/mystery story and Rendell’s excellent story has no corresponding TV or movie. 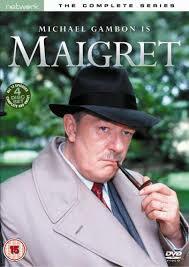 The authors are credited with creating some of the great detective series or movies including Columbo, Little Caesar, Naked City, Perry Mason (although this was not one of the better stories), and Maigret. A lot of the series are British and the dates range from the 1920s to the 1990s. At the beginning of each story is a short bio of the author and an explanation of the series for which he/she is credited. The Mammoth Book of Movie Detectives and Screen Crimes is not your run of the mill mystery anthology. It contains stories and authors you may not have heard of and mentions series that you may be unfamiliar with. It’s a nice way to broaden your mystery horizons. 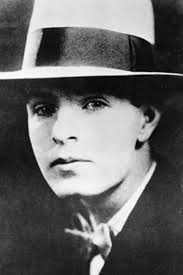 I think the next mystery author I’m going to tackle is Cornell Woolrich. I’ve read some of his stories but not enough. So move over Hammett and Chandler, I’m going to dig up some Woorich. When Beverly Hillstrom, Vermont’s chief medical examiner and girlfriend of Vermont Bureau of Investigation detective Joe Gunther, asks him to look into the death of her cousin, Ben, how could he refuse? Ben, a Vietnam War Signal Corps photographer and a hoarder, was found crushed to death under a pile of his collection. The cause of death from Hillstrom’s autopsy was inconclusive. When Ben’s estranged ex-wife is found tortured and murdered soon after, Gunther’s senses are on high alert. As they search Ben’s house, another body is found. The murders coincide with a local exhibit, organized by Hillstrom’s daughter Rachel, of Ben’s photos. Soon, a curator of the exhibit is attacked in her bedroom and the Rachel’s faculty advisor, who assisted in the exhibit, is kidnapped. Gunther surmises that the photos may be at the crux of the killings and Rachel, too, may be in danger. Gunther’s VBI team goes all out to unravel this baffling situation. 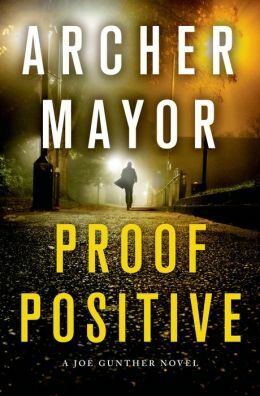 Gunther and the regular crew, Sammie Martens, Willy Kunkle and Les Spinney, are back in full force in this absorbing 25th book in the Joe Gunther series, Proof Positive. One of the things I like about this series, is similar to the characters in Ed McBain’s 87th Precinct series, these characters age as the books progress. Their personalities and life situations evolve over time. They’re not static as they are, for instance in the Sue Grafton’s alphabet series. I also love the Vermont setting: the mountains, the snow, the forests and rivers. I especially like how he talks about the industrial history of Vermont. I see that as I drive through all of New England, the old factories shuttered. Mayor has created an interesting, unique set of criminals as well. They match wits very well with the VBI detectives. There is mystery and suspense to satisfy any reader. I admit that I skipped a few books in the series. I just didn’t get around to reading them (too much other good stuff). However, it still felt like a family reunion. Those unfamiliar with the series will still enjoy Proof Positive immensely. The book stands alone quite nicely. A perfect book for fans of police procedurals, detective fiction and good mystery writing. 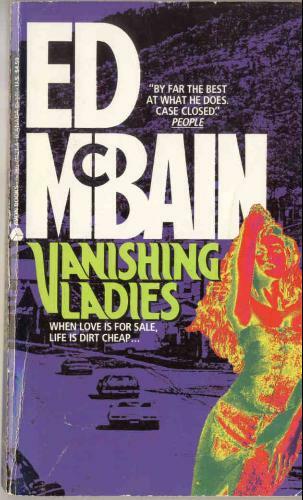 Vanishing Ladies by Ed McBain is interesting in that the story is told as a police officer giving testimony in court. Philip Colby and his girlfriend Anne are going on vacation together to a lakeside getaway that Anne used to go to as a young girl. Driving a car borrowed from one of Colby’s fellow police officers, they are stopped in a small town by a motorcycle cop. As Colby is looking for the car registration in the glove compartment, the motorcycle cop notices a gun. As it’s a friend’s car, Colby doesn’t have the registration for the gun or car. Colby and Anne are dragged to the local magistrate until it can all be ironed out. As it is late when they are finally released, they attempt to drive to their destination but end up at a desolate motel for the night. He checks in himself because Anne is asleep in the car. The owner, a sleazy looking man, says Anne can sign the register in the morning. As it’s the 1960s, they book two rooms–adjoining. Colby goes to take a shower and upon returning wants to say goodnight to Anne who is not in the room. He also finds a strange woman in his room. When Anne doesn’t return, Colby goes to the motel office and the owner denies ever seeing a woman in the car, insisting Colby checked in alone. Colby insists on searching every room and, although he doesn’t find Anne, he does find blood in the room adjoining his on the opposite side. Colby refuses to let things alone, despite warnings from everyone he comes in contact with. Vanishing Ladies is a fast read and a worthwhile one. Just like a well designed plate of food enhances the taste of a meal, so too a well designed book cover enhances the reading experience. In the 1700 and 1800s and even into the early 1900s book covers were considered decorations to be viewed. The Golden Age of book covers lasted from the late 1800s into the early 1900s, ending with the advent of book jackets and paperbacks. However, from a mystery book standpoint, the pulp mysteries published in the 1930s to 1950s have some of the best artwork imaginable, in my mind anyway. It may be considered ‘campy’ now, but it added a flavor to the book that would be missing otherwise. 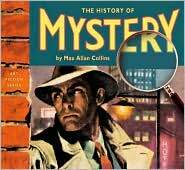 The History of Mystery by Max Allan Collins, a mystery writer in his own right, combines the history of the ‘non-policeman’ detective with plentiful photos of book covers, movie tie-ins, TV show ads, etc. Divided into 10 sections, Collins covers the people who made mystery what it is: A. Conan Doyle, Edgar Allan Poe, Raymond Chandler, Agatha Christie, Dashiell Hammett. He covers female detectives (Kinsey Millhone, VI Warshawski) and TV detectives, reminding me of some of my favorite shows such as Mannix, Spenser for Hire, Honey West, the Rockford Files. There’s a lot of interesting trivia (I never new there was an Ed McBain detective magazine) and a lot name dropping of many people who might be unfamiliar to mystery readers but were influential in the field, such as Roy Huggins who created a number of wonderful TV shows including 77 Sunset Strip. Collins must think like me–that the presentation is an important part of the package. The glossy pages, some with a colored background, the full color photos of book covers, the portraits of mystery greats all add up to a great reading experience. The History of Mystery is an easy to read, eye-catching history of one of the great genres. As I said in the beginning, this book doesn’t cover policemen so don’t expect to see Harry Bosch or the 87th Precinct mentioned here. Maybe that’ll be Collins’ next book…hint, hint. Twelve out of 50…not a good showing for a mystery buff. I know my what reading list will be for a while. I must say, there are few authors missing though, such as Ed McBain and Thomas H. Cook, for example. I’m most of the way through James Ellroy’s The Black Dahlia. Not loving it. As a matter of fact, it wouldn’t make my top 50 list. Hope this isn’t an indication of the remainder of the books on the list. Wish me luck. I’m open to anyone’s list of top 10 all time great mysteries or mystery authors. Send yours in.